Having a blog means at a certain point people will start asking if they can send you their books to read and review. I try to avoid book reviews because for one, I find them boring and secondly, I don’t like many of the books sent my way. However, a few weeks back I received an advanced copy of How to Turn Your Marriage Around in 10 Days by Philip Wagner, Sr. Pastor of Oasis Church in Los Angeles. I started to casually peruse it like usual, expecting just another “marriage miracle” book and I have to say, this book might actually be the real deal. Turns out, Wagner and his wife have been married 27 years and have counseled couples all over the world. So, it’s no surprise that his book is full of practical, candid, and relatable advice. So much so, that it inspired me to write a post in response. Now, I don’t need to turn my marriage around in 10 days, but Wagner acknowledges that even if you have a great marriage there are still valuable lessons within the book’s pages. Does prioritizing time with friends speak about your spouse’s needs and wants, or yours? Do your checkbook entries reveal money spent growing your relationship, or escaping it? What is the priority of your life? Now, I don’t know about you, but I strongly believe that where we spend our money is a reflection of our heart. I never thought about actually spending money to grow my marriage, but in reality, that is exactly what Jonathan and I do. We save to take much-needed-child-free-vacations. We have date night every week and have committed that if ever there was a time when we would need to pay for babysitting (cause’ grandmas are awesome and free) we would. We spend money to prioritize our relationship. Wagner goes on to say,”“Is your marriage business-centered? Children-centered? Friend-centered? Ministry-centered? Or is your marriage itself the priority? Often times, Wagner explains, we are afraid to prioritize our marriages for fear that they will become idols. We believe in not neglecting our marriages or not letting them slip down on the list of priorities, but that is not the same as creating a marriage-centered life. My husband has told me from day one of life together that I would always remain his number one ministry. Our marriage takes precedence over our children, our church, our friendships, our extended family. Some people find this idea uncomfortable or out of order. But, assuming both spouses are living Christ-centered lives, the next and logical priority must be one’s marriage. My children, family, friends, and church will see a healthy marriage. That is our witness of Christ. In prioritizing our marriage, we are painting for those watching an intricate and powerful portrait of Jesus’ love for His bride. When we consider that some statistics suggest that the average marriage lasts only 7 years, why would we wait to begin cultivating marriage-centered lives? Think about what takes your attention away from your marriage. Is it your career, money, friends, hobbies, or goals? Is it your ministry or Church? How will you prioritize your relationship? What will you give up in order to have a marriage-centered life? 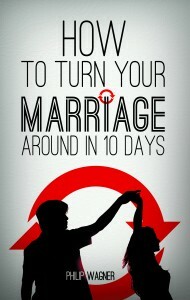 To learn more about How to Turn Your Marriage Around in 10 Days and hear thoughts from Phillip, visit www.philipwagner.com, like him on Facebook or follow him on twitter@philipwagnerLA. Yes. Yes, it is. After the covenant of Salvation and sonship I have with Christ, my marriage covenant is my next priority. My bride is my ever-present thought. She is my consistently offered prayer. She is that persistent focus of mine. She prays for me, I pray for her, and this way neither of us needs to waste time on self prayers. since we have each other covered, and we know the other has our back. The surest way to cripple a marriage is to put the kids first. Your covenant is with your spouse; you are stewarding your kids. Big difference. I would wager dollars to donuts that when a married couple with kids laments having marital issues, it will fall on how they have put their children first, and their marriage revolves around them. Yikes. Covenant. Jesus first, spouses second. Simple. “Your covenant is with your spouse; you are stewarding your kids.” Man! I mean, I know this intellectually, but I’ve never said the two things in one sentence. Such truth and wisdom. You belong to your husband, and he belongs to you. His body is yours, and your body is his. Covenant. Out of the two of you becoming one, there has sprung forth other lives, your kids. Amazing. So one plus one equals one, (or in your case 3! ), essentially. Covenant always produces fruit. Always. From the best of all, which is Jesus and His Bride, to us as being married Kingdom citizenry, covenant always produces fruit. There’s something there I cannot quite grab. Maybe you can. It’s eluding me. My husband reminds me of this often and it’s been a strength for us. Also, personally, since my husband’s and my schedules have shifted and have been somewhat crowding our time, we took the four free hours available this week and went to dinner and a movie. Just doing this has imparted within me so much more confidence and joy and fulfillment. It seems materialistic at the outset, but it’s worked. Sounds like your wife is a lucky woman! Our marriage takes precedence – YES. It seems that Christians think anything church- or ministry-related must come first, that it’s selfish to put your marriage before your kids, but that’s so backwards. So many families are unhappy (or even broken) because we forget that our spouse is to be our first ministry, with the rest of our family coming second, and then other ministry coming later. Thank you for this reminder. We will celebrate 18 years of marriage this month and up until 2 years ago we put our son, our jobs, our homes etc. in front of our marriage. We did not focus on first things first- Christ, so that second thing- our marriage, would come easier. Easier not in the sense of “perfect & smooth” but easier in the sense of commitment and growth as One. Never again will we put anything before our relationship with Christ or our marriage. So many people see this as taking freedom from them, but in reality if makes you free. Free to be what God designed when he knitted us together. I am honored to be One with my husband and show that honor by honoring one another in various ways beginning with time with Christ that leads into sacred time together whether it be out of the house on a date or sitting and holding hands on our couch. I hope more marriages begin dating one another and making it a point to learn something new about their spouse each day. It matters. As a church planter, I have to confess that Ministry can be the recipient of my affections more times than my wife. Especially in this initial stage. Nicole, any words of wisdom for the minista?! As a husband, simply confirm with your bride that in this season of ministry, you and she will be separated (not permanently, of course). Voice it together with her, aloud, with The Spirit as your witness, to steal the thunder from the enemy when he seeks to come in and tempt either one of you, and not allow him a foothold. By standing in agreement as covenant walkers, the Lord shall be your third. Ministry in al of its rewards and blessings can certainly steal away our marriages just as quickly. Practically speaking, Jonathan and I check-in with one another. Sounds overly simple maybe, but it works. If we’ve been ministry-heavy we make sure to stop and ask one another how we are doing as a husband and/or wife. Does the other feel neglected? Have we been doing a good job of communicating? Do we need to schedule an extra date night or romantic dinner at home? Also, setting boundaries from the beginning is critical. Are there hours that belong to your family? For us, dinner hours are protected. We sit down as a family every night. Ministry can happen before and after, but not in that 1 1/2 time slot. What boundaries are you guys willing to draw? What do you want to protect and how will you do it? Prayers your way, friend, as you navigate church planting, Kingdom work, and married/family life. God is able to bring balance and guidance to all those areas! Now THAT was wisdom. Nicely said, Nicole. Nicely said. WORD! Connecting Checkbook (finances) specifically to marriage priority…as the Guinness dudes would say…”brilliant”. When the airbags drop from the compartments above your airline seats, what are you supposed to do? First, put on your own mask, then put the masks on your kids. We understand the simple truth that we cannot help anyone else unless we are doing well ourselves. Husband and wife is the smallest ministry team, with its first priority the health of the team itself so that others can then be taken care of. Satan works hard to destroy marriages so that he can destroy families and churches and their demonstration of God’s love to the world, so that he can keep people from coming to Christ. Christians who neglect their marriages or allow Satan to slowly divide the spouses by turning the attention of either or both to some supposedly greater cause fail to understand the importance of their marriage in the great scheme of God’s plan. Is your marriage great? Praise God! Keep up the good work (because you obviously are doing work to keep it great). Is your marriage any less than great? Stop and FIX IT! Buy the book, go to a Family Life Weekend to Remember, call a wise person who has a great marriage and get some advice, make an appointment with your pastor, see a marriage counselor, or do whatever it takes to get on the right track NOW because if you don’t fix it, it will only get worse. Don’t neglect this precious gift God has given you. You were once excited to spend time with that spouse of yours. Get away and talk. Confess your sins to one another and forgive each other. Hit the reset button. Rekindle the passion flame. Fulfill God’s will for your life and enjoy His blessings upon your relationship and your home and your other, lesser, ministries. After doing something stupid yesterday, I realize I need this book. 26 yrs of marriage can be totally screwed up by one mistake or by ignoring important things. Never forget that. Thanks for your post yesterday. Great stuff here. We talk a lot about our budgets reflecting our values–but usually it’s in relationship to how much we’re giving and how much we’re keeping to add to our (already very privileged) lifestyle. I’ve never looked at our budget before in terms of how we’re building up our marriage. It’s so true though–we spend money on the things we care most deeply about. If we’re not willing to spend money to keep our marriages strong, then our priorities are not in order. It’s difficult because so often the things we put ahead of our marriages are good things– church, ministry, children, helping others. But a good thing, not put in its proper place in our lives, can be just as destructive and hurtful as the “bad” things. One of my favorite quotes is: “Put first things first and we get second things thrown in. Put second things first and we lose both first and second things.” Of course, first always has to be our relationship with Christ, but if our marriages come next, I think the other stuff falls into place much more easily. “Money is 5% of your marriage, but it can be 95% of your problems.” Just a passing thought. I would probably describe my desire as wanting to have a Christ-centric life as a married woman. As in, Jesus should be my (& my guy’s) center focus. But, we are married to each other, meaning we should always seeking to grow in oneness, with Jesus as the center anchor. Marriage is not just a thing in our life, something on the list. My union to my husband changes who I am. I am part of him. We are in this together. He and I. And I am so grateful. Because of that, he is, indeed my TOP earthly priority. Previous Previous post: Are There Degrees of Sin?